I am often in a hurry and very hungry. I have come to accept it as a fact of life that my body demands to be treated like it was when it was a newborn- it must be fed immediately at the slightest twinge of hunger pangs. Over the years I have therefore accumulated quite the arsenal of healthy and quick dinner recipes in order to keep the hunger monster at bay and stop myself from devouring all the contents of the ice-cream drawer in my freezer. This one is inspired by something I watched the folks over at Lardo cooking. Whenever I go there I like to sit on the bar, overlooking the kitchen. It’s just brilliant to watch them cook, and i always get loads of ideas for my own little cooks. While it cooks, chop the bacon or pancetta and fry it in a dash of olive oil. When the meat starts to brown, add the thinly slices chillies. When there is about one minute to go on the pasta, add the greens to the chilli and bacon. 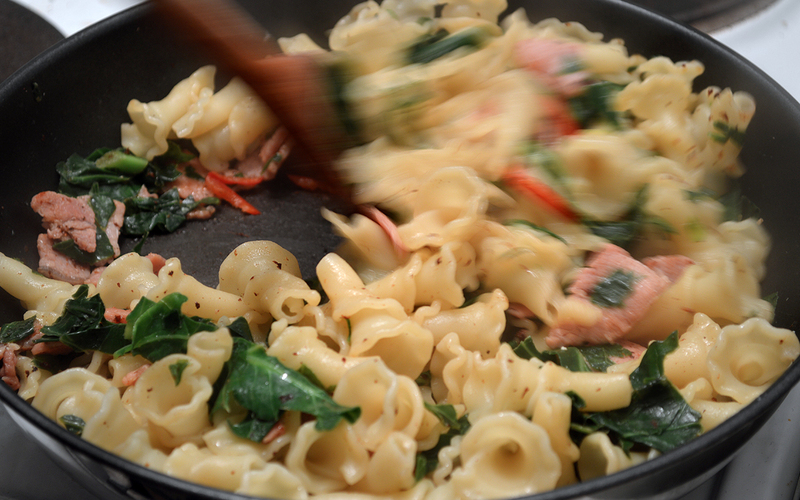 Drain the pasta when it’d done, and toss it in the pan with the bacon and cavolo nero. Add a good glug of better oil and serve with grated parmesan. This is a definite must try recipe – looks delicious! Thanks so much Georgina- it really is brilliant, and so so quick!